What is the ‘20% off-the-job-training’ rule? Apprenticeship rules state: Apprentices must spend a minimum of 20% of their paid working time completing ‘off-the-job’ training. This is not the barrier that most employers fear it will be! The first thing to note is that this ‘20% minimum’ requirement only applies to the training phase and not the end-point assessment phase of an apprenticeship programme. So typically, a full-time sales person enrolled on the Sales Executive Apprenticeship would spend, on average, 6-7 hours a week completing ‘off-the-job’ training activities over the course of their 10-14 month training period, then substantially less time ‘off-the-job’ preparing and completing their final assessment during their final 3-4 month assessment period. 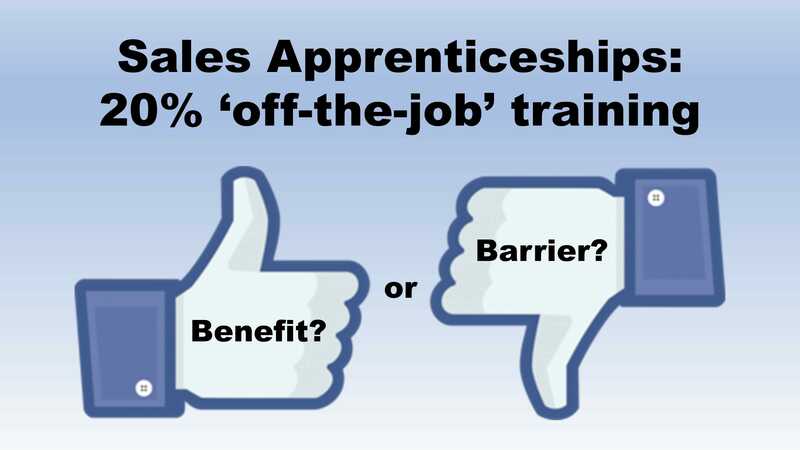 Apprentices do not need 1-day ‘off’ each week for training! To explain why, let’s first look at what the term ‘off-the-job training’ actually means. For many people, the term ‘off-the-job-training’ is misleading, or least its meaning isn’t clear without further explanation. 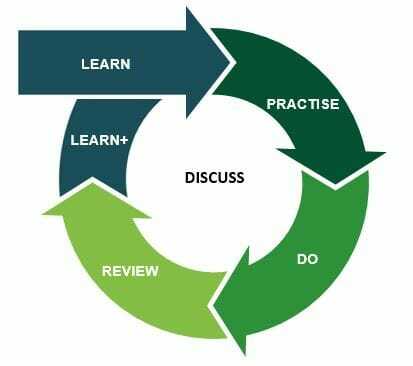 As you can see, there is nothing within the flow-chart (or within the more detailed government guidance) which dictates where the training must take place. This helps to bust one common myth; the requirement for ‘off-the-job’ training does not mean the learning cannot happen within the work place. For this reason, I believe that ‘off-the-job training’ may be better described as ‘managed learning’, or more accurately, as ‘managed learning of new knowledge, skills and behaviours that are directly linked to the apprenticeship standard, which takes place during the apprentices normal working hours’. What types of activities can it include? Off-the-job training may include almost any type of managed learning activity. As you would expect, an apprentice’s off-the-job-training will include learning resources and activities provided and delivered by your training provider, but it can also include learning opportunities that happen naturally within the workplace. 3) record the learning within the apprentices learning record. So, off-the-job training can include managed learning in almost any form that is completed at almost any location. This enables innovative training providers to create flexible work-based learning programmes that not only comply with government rules, but also meet the learning needs of each individual apprentice, cause minimal disruption to the apprentices working role, and maximise the return on investment for the employer. Our industry leading approach to blended work-based learning does just this. It not only ensures that apprentices remain engaged throughout their programme, it also ensures that the knowledge and skills they develop are quickly applied within the workplace, embedding behaviours and generating improvements that deliver a rapid return on training investment. FieldStar Founder Steve Radford is a work-based learning professional specialising in on-the-spot and short-chain sales. Steve worked closely with the Trailblazer group of employers, providing consultancy advice and support as they developed the Standard and the Assessment Plan for the level-4 Sales Executive Apprenticeship.